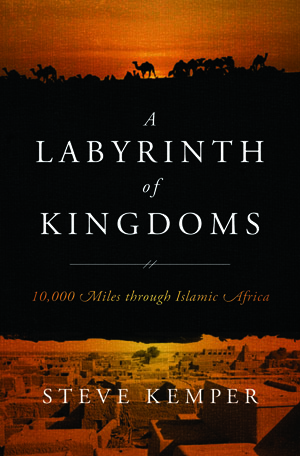 When invading Arabic armies spread Islam across northern Africa in the 7th and 8th centuries, one group ferociously resisted conquest and conversion, leading the Arabs to call them Tuaregs—“the Abandoned of God.” They called themselves Imoshag or Imajughen, meaning either “the free people” or “the noble people,” or Kel Tagelmoust, “people of the veil,” or Kel Tamasheq, “speakers of Tamasheq.” Eventually, like the rest of northern Africa, the Tuaregs adopted Islam, but with typically noncomformist twists. Timbuktu was founded as a Tuareg encampment, and the town has always been populated by these legendary “blue men” of the desert, famous for their flowing robes and turban-veils, dyed a deep indigo that rubbed off on their skin. Tuaregs were haughty and belligerent, indifferent to hardship, merciless to enemies. For centuries they were the scourge of a vast area across north-central Africa. They moved at will across the desert with their herds of camels and goats, plundering caravans and each other. But in the 20th century, colonization, aggressive central governments, and droughts curbed much of their mobility and killed most of their animals. Their nomadic life began sputtering out. In Timbuktu many Tuaregs now live in permanent houses and sell hand-made jewelry, not camels and goats. During the years of Barth’s journey, 1849-1855, Tuaregs still ruled the desert. Barth spent a lot of time among them, some of it life-threatening, yet he admired their toughness, elegance, and fiercely independent way of life. Tuareg men, then as now, were distinctive because of their tagelmoust or turban-veil. They wrapped this ten-foot cloth around their head, leaving a slit for their eyes. Once a Tuareg male reached maturity and donned the tagelmoust, he never took it off in public and wore it even when eating and drinking. Every Westerner noticed that Tuareg culture upended certain practices of Islam. The most striking was the position of women. Most Islamic women in north Africa were highly restricted and preferably invisible, kept indoors and covered from head to toe. Not Tuareg women. They didn’t wear veils—only the men did. They didn’t hide their sexuality–in fact they emphasized it with henna and kohl. Nor were they confined to the indoors or to certain areas of the dwelling. They usually ate with the men and guests, not separately. Unlike their fellow Muslims, Tuaregs didn’t fetishize female purity. Young Tuaregs of both sexes mixed at social events filled with music, dancing, and flirting. Couples wandered off into the desert night. This time of courtship and experimentation was called asri, “to gallop with free reins.” After marriage, a woman wasn’t put into seclusion but could visit her friends at will. Westerners universally commented on the easy respect between Tuareg men and women, and on their tenderness for their children. Though Islam allowed a man four wives, monogamy was typical among Tuaregs. All of this, plus their mystique as wandering blue warriors, made them fascinating to Westerners, including Barth. His experiences among them, from the desert mountains of Aïr to the dunes of Timbuktu, are among the highlights of Travels and Discoveries.